>OMG.. that is so dang FUNNY!!! and sweet at the same time! ;)and a good sunday to you too! >What a position! Must be comfortable. I have seen my dog in some weird positions but not like this. >My “baby” (85 lb golden) likes to sleep on the oversized chair…on her back! It’s pretty funny! >That is the cutest picture! He looks so peaceful, despite his long legs hanging over the edge! >this is the first time i’ve seen a dog sleeps that way! 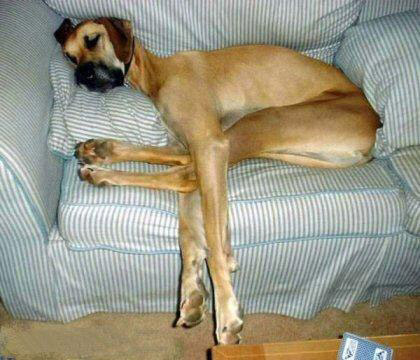 very funny but he looks very comfortable. >Great choice of pictures! What a cool one that is! « >What I made over the weekend..
You are currently reading at fireandglass.